cherries in baskets, originally uploaded by Rcakewalk. It has been one week now since my total and complete obsession with cherries. 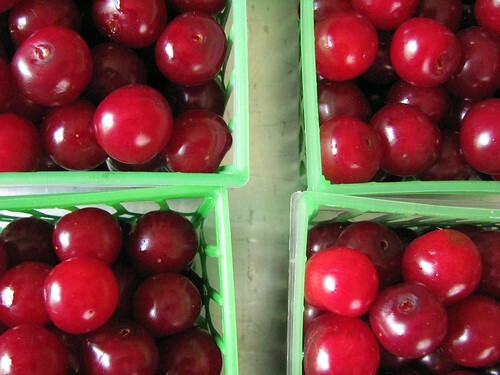 Last Saturday when Elisa and Laura were here, I happened to try some tart cherries at a farm market. I was a goner. I bought 2 baskets, and half of 1 was probably missing by the time we walked back through my door. Since, I've been back twice. Yesterday I bought 8 more, since I was warned by the super nice farmer that the end is nigh. This evening I made jam from a recipe I got off of Food in Jars. I spent a fair amount of time in perusal of her site determining that I was indeed going to can more this year. I was in part inspired by Food in Jars, in part by Boy-O's addiction to eating pickles, and my own recent obsession with these tart cherries. After said jam making, I still have 5 beautiful little baskets left. What to do? I'm going to try my hand at a cherry liqueur. I found a nice recipe at Homestead Farm, so I think I'll give it a try. Meanwhile, I'm also addicted to flickr. I upgraded to pro and can add a million photos; it's fun to see what other people are taking pictures of too. It's too easy to think that I'm in my own little corner of Wisconsin, and not take time to remember how big the planet is. Well, quite a bit smaller now due to flickr, I think. Amazing still to see what other creative people are doing in all parts of the world.